It is always good to get your kids started off on the right footing when it comes to money, and what better way to save than to watch their savings grow in due time? With the Digital Counting Piggy Bank, it makes saving all the more fun since you’ll be able to know the exact amount inside without having to painstakingly count every single coin. 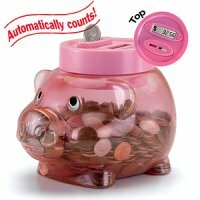 Piggy bank counts and keeps track of spare change for you! Not your typical “piggy” – electronic slot and LCD screen automatically track and display your total savings. Twist-off lid for bulk deposits and withdrawals. Features count-up/count-down controls to keep total accurate. Great for teaching kids to add and save money. Requires two AAA batteries (not included). Since the thing is made out of plastic, you don’t have to get a hammer to access your hidden stash during times of emergency thanks to the twist-off lid. You can pick up the Digital Counting Piggy Bank for $29.98 and get Junior on the saving program early in his life.